In 2019, the four swords China Vending & Smart Retailing Show (CVS), Expo Clean for Commercial Properties and Hotels (CCE), Expo for International Facility Management (CFME), Expo for International Indoor Air Purification (CIEQ) will exert force together and comprehensively upgrade to the "Shanghai International Unmanned Business Expo （UB-China）", which will be grandly held at the Shanghai New International Expo Center on April 25-27, 2019. The unmanned market is developing rapidly and becoming a hot spot in various industries. In 2019, influenced by multiple factors such as the new technology revolution of the Internet of Things, the turning of Internet traffic, the disappearance of the demographic dividend, the upgrading of traditional industries and the upgrading of domestic economic development modes, the concept of "unmanned business" in China has risen rapidly and ushered in a golden period of development. "Unmanned business" refers to the new business model formed by applying new information and Internet technology in the commercial system after combining with professional equipment or facilities. In the past two years, there have been a series of typical new business forms such as unmanned retailing, unmanned cleaning, smart business space, smart city, smart community and so on. As "unmanned business" has a strong scientific and integrated nature, it has extended to various areas of consumer life in a very short period, forming a rare business hot spot in recent years. During the same period of the exhibition, China Unmanned Economy Conference, China (Shanghai) International Property Cleaning Summit Forum, and Cleaning Industry Innovation and Development Forum will all discuss about related unmanned business. In addition, in order to expand and strengthen the influence of "Shanghai International Unmanned Business Expo （UB-China）", the organizer also coordinated SFE (Shanghai International Franchise Exhibition) and Hotel Plus-Total Solution for Commercial Properties, one of the largest exhibitions of hotel supplies in China, which will be held in the same period. By then, the total exhibition area will exceed 200,000 square meters and it is expected to attract more than 300,000 visitors. Shanghai International Unmanned Business Expo （UB-China） waiting to see you in 2019 Immediately pre-register to learn more about the new trend of the exhibition. 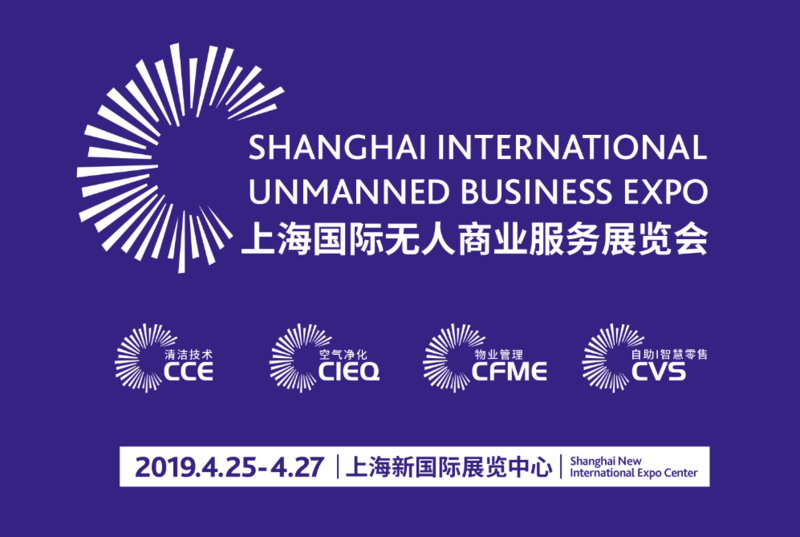 The visitor pre-registration system for the 2019 Shanghai International Unmanned Business Expo （UB-China） is fully online. Click here to complete the registration. Shanghai UBM Sinoexpo's CCE (Expo Clean for Commercial Properties and Hotels), CFME (Expo for International Facility Management), CVS (China International Self-service, Kiosk and Vending Show) and CIEQ (Expo for International Indoor Air Purification) will be present at the N1-N4 Pavilions of Shanghai New International Expo Center. In order to better show the form and development of future unmanned business, the organizer has specially cooperated closely with relevant industry associations and professional academic institutions to carry out comprehensive upgrade. The four exhibitions like four swords have been comprehensively upgraded to the "Shanghai International Unmanned Business Expo （UB-China）", which will show up grandly in the same period.